The Madden Classic is going on this weekend, along with a slew of big ticket tournaments at DreamHack Denver. Destiny marches on at Worlds 2017 meanwhile, with SKT and Samsung still in the mix after Longzhu Gaming fell late in the week. In addition, Dota 2's competitive scene will get a chance to sort itself out in Germany as some of the top teams meet ahead of the 2018 season’s first Major. The quarterfinals of Worlds 2017 are almost over, but there’s still one series left to play out. Cloud9 take on Team WE Sunday morning at 4:00AM EDT in a best-of-five that will determine who makes it to the semifinals and whether the road for North America ends here. You can catch all of the matches, as well as the 3:00PM rebroadcasts, here. The Madden Classic finals are about to go down after months of play, with a $100,000 prize pool tournament deciding the winner. It’s the first major competetive event of the year for the game, with the winner earning a spot in the Ultimate League next year. Play resumes today at 5:00PM EDT. PGL Open Bucharest brings back top-level play in the esport this weekend with a $300,000 prize pool even which will also grant qualification points to the winners for the 2018 International. Evil Geniuses play VGJ at 1:00PM EDT today, with the semifinals getting underway on Sunday starting at 4:00AM. The event’s grand finals will take place at 11:30AM later that morning. The HCS Pro League Fall Finals kicked off yesterday in the American Midwest with a whopping $200,000 prize pool thanks in part to crowdfuning via the game’s fanbase. Team Envyus, Liquid, and Optic Gaming will be in attendence along with five others, as well as open play teams. The Fall Finals bracket play will start on both today and Sunday at 3:00PM EDT, with grand finals occurring later in the day. You can watch the entire tournament in the stream below. Gfinity Elite Series Season 2 continues starting today with Prophecy vs. Epsilon Esports at 1:00PM EDT which you can watch here. But there’s lots of action in the ECS Season 4 this weekend as well, with Astralis taking on Virtus Pro at 1:00PM in Europe and Cloud9 vs. Immortals at 6:00PM in North America. Those matches will be streaming here. And of course DreamHack Denver will also be hosting a CS:GO event, with the grand finals scheduled for 7:00PM on Sunday. You can watch that entire tournament here. For Smash Bros. DreamHack will feature a Smash 4 and Melee tournaments with almost all of the top talent in attendance. Singles pools will be played throughout today, followed by top 8 for Smash 4 at 3:00PM EDT on Sunday, followed by Melee top 8 at 6:30PM. Street Fighter V will also be at DreamHack with top 8 scheduled for Sunday at 12:00PM EDT, available to stream here. There’s also Proving Grounds Season 2 in Chicago, however, with all its action wrapping up later this evening beginning at 8:00PM. You can watch those matches here. Toushinsai 2017 is also going on right now in Japan. The arcade game extravaganza will feature competitions in almost every fighting game you could possibly imagine. Full schedules are available here and here (subtract thirteen hours to know what the times are for EDT), with the event streaming live here. 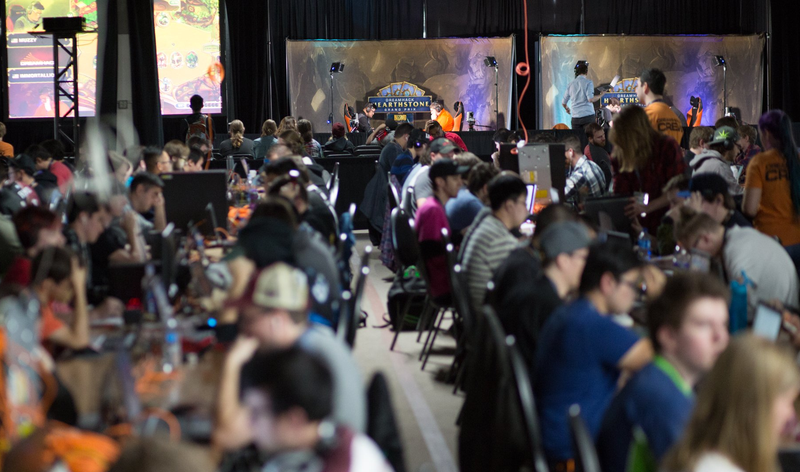 The DreaHack Hearthstone Grand Prix takes place in Denver this weekend with a $25,000 prize pool and plenty of HCT points to be awarded. Matches are ongoing throughout today and Sunday, with everything streaming live here. The Tekken World Tour will also be stopping in Denver this weekend. With a $15,000 prize pool, matches get underway today at 2:00PM EDT, with top 8 finals scheduled for Sunday at 5:00PM. You can watch that event here. The APAC Season 3 series comes to a close with the quarterfinals taking place later today. The grand finals, meanwhile, are scheduled for 12:00AM EDT Sunday morning. Of course, you can always stream the results after the VOD is posted later in the day. All of the matches are available here. In an otherwise quiet weekend for Blizzards arena shooter, play in the APAC Premier Group B continues starting at 4:00AM EDT Sunday morning. You can watch all those matches here.